He had a colorful dog purse in one hand, and a skeptical look on his face. It was November and the water was too high to give tours. He walked up to me with the dog purse and asked, “What, exactly, does this have to do with the cave?” I knew from his tone that he was, like me, a bit of a purist. I could tell that the point he was trying to make was that a cave gift shop should only have cave related gifts. I recognized this because I was skeptical once too. There is a reason that we transformed our little souvenir shop with postcards, t-shirts, and rocks into a full blown gift store. It is wonderful that when people are visiting for tours that they can get a Lost River Cave coffee cup and help conserve the cave, but there is a long part of the year that we cannot rely on tourism dollars. As a veteran tour guide at Lost River Cave I know that after Labor Day, there is a collective tightening of the belts around here. The visitation drops steadily through September and October then all but dries up in November. Our mission to protect this cave and to provide nature center resources like our Nature Explore classroom and Hiking trails to the community, quite frankly, costs money. To pay for those things we try to generate income all year long, not just May through August. In the early days of Lost River Cave, we had three ways to pay for the resources we provide, tour tickets, tour souvenirs, and memberships. (You really should become a member by the way, just click here.) With few people coming in the doors in November and December, it curtails all those sources of income. So a new source of funding was found. It just so happens that shortly after the tourism season ends, the Christmas shopping season begins. So the answer was to expand our souvenir sales into a full fledged gift store. So when fewer people are taking boat tours, we hope you will come into the gift shop and do a little shopping. If you, like me, are a purist and only want to buy cave souvenirs, come on in, we’ve still got our Lost River Cave t-shirts, our bags of rocks, and our coffee cups. If you want to help support a grass roots organization that formed to save and protect a cave, come by in November, or any other time of year, and either make a donation, buy a membership, or just buy that colorful dog purse for a little girl. “We want to give a big, whole hearted thank you to the Twin Lakes Conservation Survey Task Force. 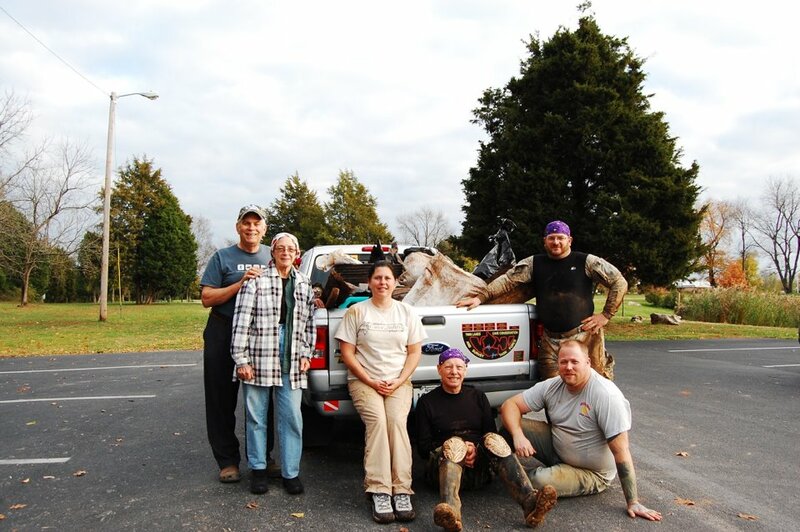 Their volunteer service for the park last weekend helped to remove approximately 500 – 700 lbs of trash from the cave. Trash and debris are carried in by flooding and can remain in the cave system- until pulled out by volunteers. Special thanks Jon Durall, Matt McClintock, Stacey Brewer, Steve Gentry, Preston & Sherrie Forsythe, Jack Ferguson and Paul Fleischmann.